DX spot when QRP love them or hate them? C5/M1KTA where am I operating (frequency)? DX spots when QRP love them or hate them...?? I have had a look at some of my trip spots recent and up to a few years ago AND the crazy qsl cards I have been sent (probably as a result)... I have included analysis in between the posts. Bit wierd some throught was still on AF-060 I wasn't. Boat trip to AF-060, finally, 90 mins of pile up. Tried 12m SSB from the beach, plenty of activity. No I wasn't you never slowed down. They have piped BOTH the TX and RX into the recordings. On the beach I could not do my usual of having the laptop or I would have recorded the pile ups at my end as well. I had loads of stations calling me all the time. Operated SSB simplex. CW is pretty clear too. The ADI log files I'll be putting up to LoTW is there as well... does not contain the AF060 SSB qso's though. Almost ready to upload C5 logs to LoTW... about 450 qso in the log. Just got to find time to double check them all before sending.... 90% were paper logged and then entered into DXlab/DXkeeper for qsl labels.... I'll hold off sending qsl cards to allow for directs for about 4 weeks then will send the lot out via buro. Might be a waste (hope not) but I'll qsl all contacts.... except the BERU contest ones and wait to see if get requests. The C5 AF-060 contacts have been checked already and are completed and for these I have printed off labels (14 direct requests processed already!) IOTA qso were only for period on 8th March 09:00 to 10:15. All others mainland contacts. 49 DXCC worked mixed modes, 102 DXCC slots. Enough about DX operating.... what have I built recently. He calls it the Ultimate Beacon V3. I have the switched LPF as well. In addition I had a RTL based USB SDR project and the adapter/converter for it arrived. It takes a 100MHz oscillator in the 8 pin DIL socket. This way you can use one of the USB DAB radios to RX HF. I built this little USB winkey lite, it will go into the box it is sitting on. This will allow me to operate CW and RTTY with the KX3 and a PC. I have a USB WinKey now but this is so much smaller. I finally finished taking all the transistors out of the TR switch by Jim Kortege that I picked up at a rally recently. I think was an SK sale. Some components were in backwards and as wrong would not work. The uPC was totally duff and going to get a new one from US. D3 was backwards so reversed it. So was C18. The transformers T1 and T2 I could not trust so removed them as well. R46 is an interesting chain of 1M resistors not one 10M. This is the board with the holes all cleaned up. I decided to print my own this time using a 10x15 photo printer I will be using DX Lab's DX Keeper to print labels. QSO count was more than I expected..... so will print directs first. 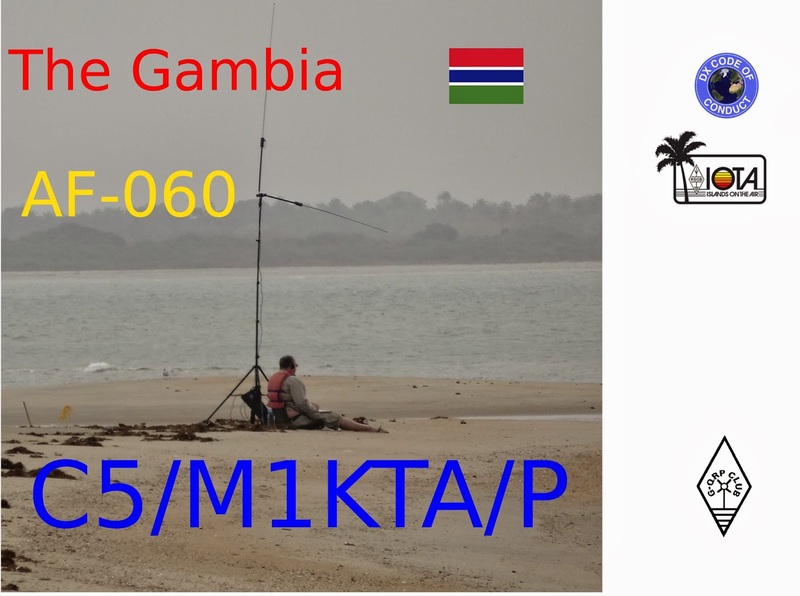 Activity from C5 was ALWAYS QRP (5W CW or 10W SSB) and always from the beach. All logs will be uploaded to LoTW shortly. Thanks for all the qso and the pile ups has been a lot of fun. I'll write the trip up and put it in a post on blog. LoTW all qso within day or so back in UK. Last night saw lots of qrp NA stations in the log, this morning up at 07:00 for last hour operating before pack and return. 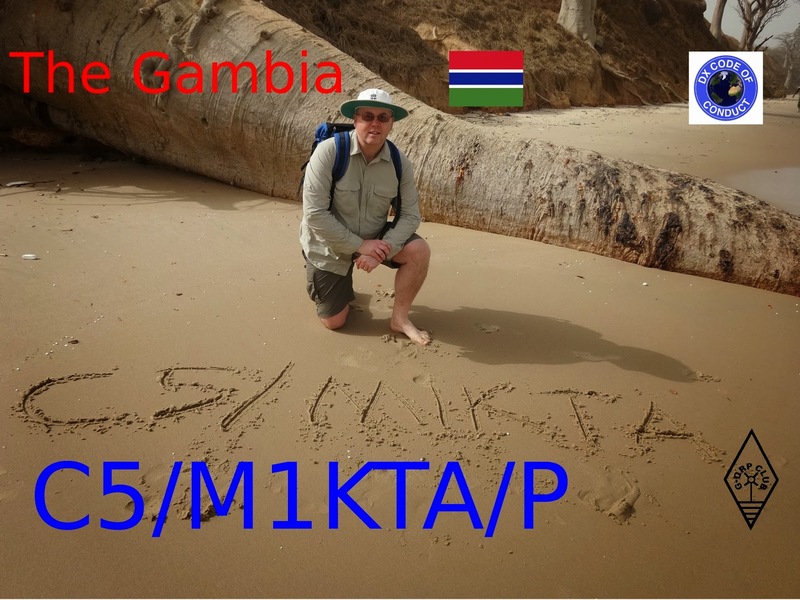 Was interesting, 17 DXCC in minutes one big one for me was ZL4PW SSB QRP so I was only 10W from the beach with KX3, battery and my buddipole. Pure magic to sit there watching the Pelicans on the beach as the sun was coming up.... and to have qso. I had to run the last session DOWN 4 (already asked why) after was spotted, was running simplex up to then as there were stations running splits either side and up was hopeless for me... 15m was busy this morning. Never managed to get out to AF-060 in 2012 but arranged it this time through the Tanji Bird Sanctuary .... should be QRV between 8:00 and 12:00 for about 90 minutes or so, boat and tide dependent. Likely to be 15m, 17m or 20m SSB ONLY. Honestly depends what is open for me. I will be qrp, KX3, vertical dipole on a fishing pole or using a buddipole. No DX cluster/twitter or anything else when qrv so listen for instructions on air. Likely to be operating SSB UP 3 so please check that the DX spot is not where YOU TX if I am on it. I will be rushing direct from this to the C5 location back on the beach for BERU. G4BUE, G3ROO and then G3XTT all within minutes on 17m (18.095 UP2) and then dratted "low battery" warning and went qrt. As I have told everyone that has emailed.... skeds are NOT working. No beam at this end either so no cannot turn to xyz dxcc, yes know you probably did not but so many have. I have wire dipoles, kx3 and qrp only on batteries from the beach. So QRV time is about 90 mins from the first key down or mic ptt no margin after that. The absolute best option for CW is qrs qrs qrs and if you sill think you might be too fast qrs again FULL CALL only please I am ignoring partials as qso takes too long and I can hear frustraited ops.. I'm a 15-20wpm cw op usually and in a pile up I get 10's of calls in a 1KHz space even when split so it is a total nightmare trying to pick out calls sometimes... why do ops insist on sending at 35wpm as I'll never get them! If I get whole call I will respond by sending it back TWICE with a 5NN, LISTEN I am only interested in the station i have called if only got some of the call will send just the letters... if I get your callwrong please just respond and I will send 5NN SRI ABT CALL TU, if I get YOUR 5NN I will say TU and pile up often starts calling again... 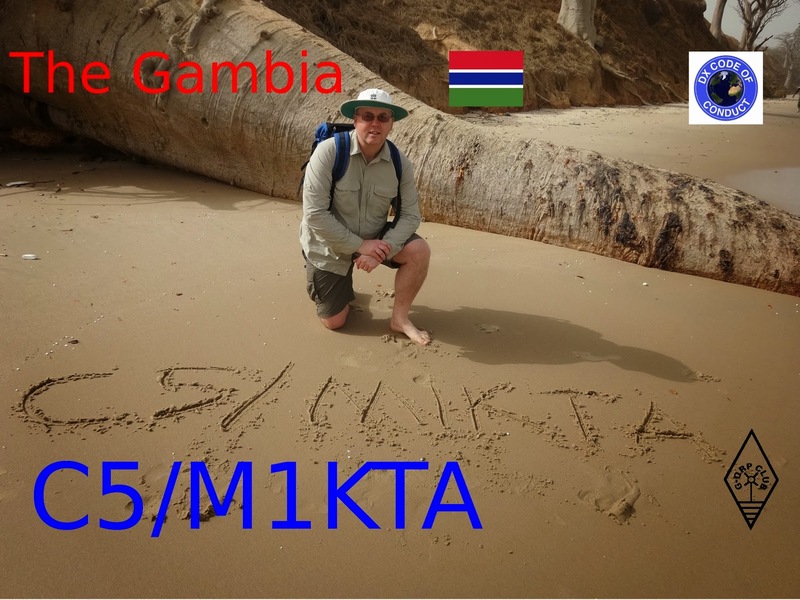 I will nearly always be split UP 1-2KHz and I will send cq de c5/m1kta up at least once every two qso so sending after a TU is not always a good idea LISTEN. I am qrp so I REALLY cannot control the TX freq if it gets swamped by anyone and I will qsy. If you see me the frequency is pretty accurate please listen before sending, not making that many calls that I am calling by area etc just whomever is there, I will listen for any FULL calls ONLY if you can QRS please I seriously cannot decode 10 at 25wpm in my head it just sounds like noise. Note NO internet when qrv this I am sending from internet cafe.... once a day at best. On the beach SSB seemed to go dead for some reason I discovered it was the wire that broke! (Got photo will include). I have the dipole I had up using Anderson power poles to select the bands and one of the wires had come out.... so the dipole became a 1/4 wave with a 4 foot GP... no wonder signals dropped off. Anyway got the soldering iron out and fixed it and the winds have dropped too now. I have a second set of dipoles that are whole wires for each band as well. Feels like taking life in ones hands recharging batteries with hotel mains (brought socket tester and they have a live fault and the earth is 'live') but managing to do it, I got an isolation transformer (1:1 saw builders one in a maintenance room and asked if could borrow it... sure not going to use it until end June was reply...) ... I don't like staying in big hotels usually and this is the Sheraton... still Africa's idea of 5 star hotel is if you turn tap and water comes out, door locks, loo flushes and lights work it's 5 star hotel... A/C seems to be none existent cooler to leave window open sometimes, not too many mosquito's this time of year! Feels more like a UK 3* to me. Tomorrow on way to collect the actual licence paperwork from Solicitors (working on emailed copies so far... not a problem) might stop off at the South end of Kariba Avenue, Westfield Junction where I bought a 12V Motorbike battery last time out here and a charger and use that instead for operating. KX3 only so should last for ages. A couple other operators are supposed to be qrv this week from C5 as they asked me for Rodine's contact info but not run into anyone on air yet. Activated 10m,12m,15m,17m,20m SSB and CW so far. Need to put the 40/80GP/s up and test before w/e of BERU. Now wind has dropped feeling more confident about night time operating and got a site close to hotel too. 7pm security comes off the beach so not safe to remain on it after that. Working another DX from a DX mid pile up especially when I am really bad at CW pile ups (still!) has been fun so far, apologies for those that might be disappointed not to get into the log but cannot work everyone that calls, and this is a holiday operation with my wife so operating time is limited. If I am operating QRS - SLOW DOWN please for heavens sake as it will only frustrate you and everyone else as I will only grab one or two letters at most and if I can figure out another caller I will call them instead. I have 10's of callers at a time even running split and I cannot work out call signs. Got to say there was a damned contest on Saturday morning, conditions were perfect but everyone on the bands running SSB was deaf or not interested in a DX qso ho hum... I think tail end of Aurora has gone through as band were dead after that (not the mid day lull) then about 6pm (local) opened up again ... short CW operating on 21m and 17m before dinner. Got a couple of ops that have worked me on all bands and modes I have been active so far... not what everyone thinks might be fair but I have to acknowledge that these guys have learnt to work with me and I am honestly just working stations as I can hear them. When struggling with the CW wall of noise it is a great relief to hear them sending a little more slowly as I can pick them out. Might be in contrast to what some suggest a DX operator should do but this works for me. I have also focused sometimes on QRS callers only and emails have shown that they have struggled with contacts with other C5 stations as they never slowed down... lesson in there maybe for some? I know I'll get beaten up by some for NOT sticking with 20wpm+ but that is my choice. Should manage some morning and evening grey line (JA last night) over this week. I note (as emailed) some spots seem to say M1KTA not C5/M1KTA, that'll be as the DXcluster does not know how to handle a C5/ call ... software developers be aware! Honestly... where ever band looks open. Please do not ask please turn beam to... 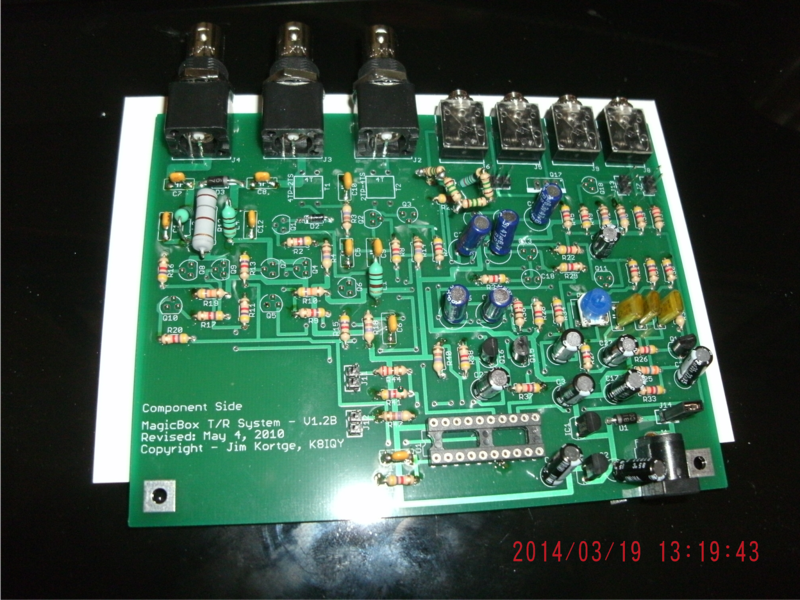 I am QRP and using vertical wire dipoles. Some of the log... I ran paper logging too on the beach so if not there if think you should be please do not panic... First LoTW uploads should be done next day or so.